The North Carolina men and women rolled through the Duke Blue Devils on Friday in Chapel Hill, with the Tar Heel men winning by a score of 176-90, and the Tar Heel women taking a 175-113 victory. Both scores were influenced by exhibition swims from UNC late in the meet. While Duke-UNC is one of the country’s greatest, most heated, and most storied basketball rivalries, the swimming battle has been rather lopsided. North Carolina moves to 119-2 all-time against Duke, including 41-0 on the women’s side. UNC has more wins against North Carolina than any other program in history; that’s a history for the women that dates back to 1974, and for the men back to 1938. Duke head coach Dan Collella was pleased with his team’s effort, despite the scores. The women’s meet started off with a Tar Heel win in the 200 medley relay, with the UNC combination of Hellen Moffit (25.47), Catherine Munch (28.60), Hannah Lincoln (24.35), and Caroline Baldwin (22.67) combining to a 1:41.09. The Tar Heels have bounced back-and-forth between Munch and Emily Pfeiffer all season long, and both have good success on the relay – the same relay as above has been 1:40.95 with either Munch or Pfeiffer on the breaststroke leg. Ann Goessling is coming on strong and might challenge for that spot after splitting 28.67 on the Tar Heels’ “B” relay. The closest race of the day came early on the women’s side, when UNC sophomore Liliana Casso out-finished Duke’s Verity Abel by less than a tenth-of-a-second in the 1000 free. The two were back and forth throughout the race, with Casso setting the pace early. Abel took her first lead at the 850 yard mark, but she was unable to get enough separation, and Casso’s kick (28.29 on the last 50) was just enough for the win. The Duke women would touch 1st, 2nd, and 3rd in the next three individual events, including a 1:49.18 from Danielle Siverling in the 200 free (1:49.18). Duke broke that run when freshman Isa Paez won the women’s 200 fly in 1:59.47. After she and UNC’s Kendall Surhoff turned almost identically at the 150 (with Allison Haufler not far behind), Paez earned a half-second margin in the last 50 yards. North Carolina would get wins in both the 50 free (Katlyn McKay – 23.18) and 100 free (Allyn Hardesty – 50.69), sandwiched around a 1-meter diving victory from Duke’s Maryellen Targonski. While UNC has a great internal battle happening in the 100 breaststroke (Goessling, Munch, and Pfeiffer were all 1:03’s), but Munch tops the crew easily in the 200 breaststroke. 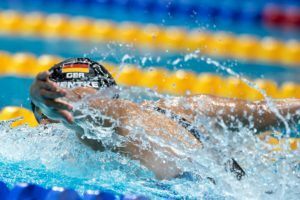 She won that race by two seconds, swimming a 2:18.02 – with the entirety of that 2-second victory being earned in the front-half of this race. The women’s 500 free saw the top four swimmers separated by just over a second, led by UNC’s Annie Harrison in 4:59.80. She was followed by Sarah Koucheki (4:59.89), Brittany Friese (5:00.24), and 1000 winner Casso (5:01.09). Koucheki paced this race early, swimming a 1:56 in the first 200 yards, but the field began a big charge on her by the 350 yard mark, and over the last 50 they reeled her in. Harrison’s even-split race (2:29.89/2:29.91) to win. After three more individual wins from North Carolina, including a 54.28 in the women’s 100 fly from Hellen Moffitt. That rolled into one more relay victory from the UNC women to end the day, where Sarah Hitchens, Baldwin, Hardesty, and Lincoln combined for a 1:33.02. All four Tar Heels were 23-lows, led by a 23.15 anchor from Lincoln. Duke got a 23.31 anchor from Chelsea Ye as they took 2nd in 1:34.34. 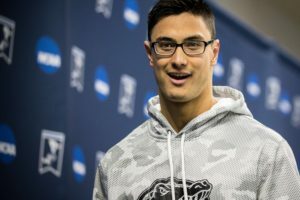 On the men’s side of the meet, North Carolina won 15 out of 16 events en route to a dominant victory – one that saw the Duke men without any of their divers. North Carolina took the top four spots in a marred 200 medley relay that official results show included three DQ’s from Duke’s relays. The winners for North Carolina were Nic Graesser (22.62), Kurt Wohlrab (24.79), Sam Lewis (20.89), and Logan Heck (19.81). Lewis’ split especially was impressive – that’s his fastest fly split since October (he was 21.01 at the Nike Cup in November, 20.96 against Virginia last weekend, and 20.78 against Georgia early in the season). That was the start of a fast, if brief, day for Lewis that saw him swim three of the maximum four races. He would win the 100 back later in the day with a 48.05, which just missed his season-best in the event. His day would finish as part of the UNC 200 free relay-winning effort of 1:20.06. In that relay three of the four swimmers split under 20 seconds – Lewis (19.89), Nic Graesser (19.86), and Chris Gondek (19.95). That was combined with a 20.36 leadoff from Logan Heck. 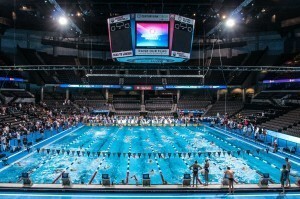 Most of the North Carolina stars swam just one race. That includes Ben Colley, who won the men’s 200 free in 1:37.63. He had a big last 50 to overcome freshman teammate Philip Perdue. Perdue bucked the Tar Heel trend and swam four events, including two individuals. In addition to that runner-up placing in the 200 free, Perdue also won the 50 in 20.59. The lone Duke breakthrough came from sophomore Peter Kropp, who won the men’s 100 breaststroke in 54.80. Kropp is the fastest breaststroker in the ACC so far this season. Dominick Glavich, best known as a butterflier, took 2nd in the 100 breaststroke for North Carolina with a 55.49. 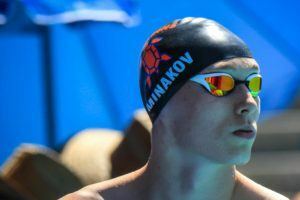 North Carolina also used Glavich on their ‘B’ 200 medley relay, where he split an admirable 24.91. 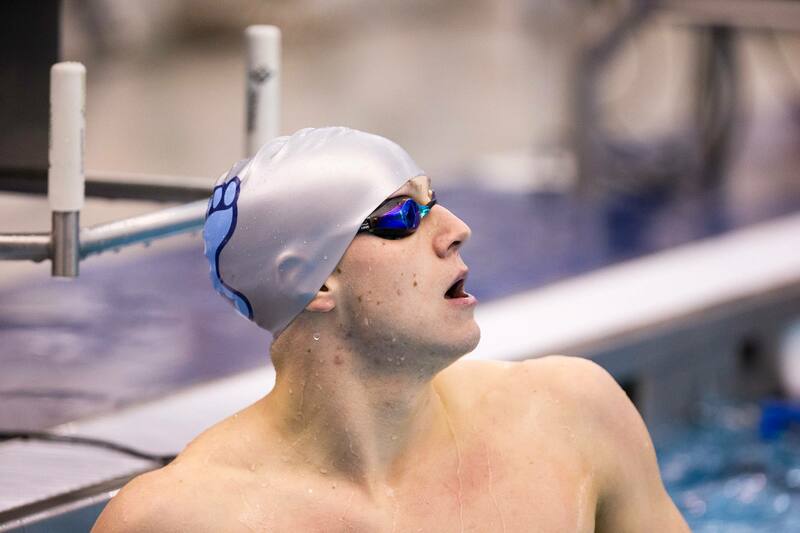 After this meet, which had an absence from UNC’s top 100 breaststroker this season Michael McBryan, Glavich appears to be putting himself in position to swim that leg on the North Carolina 400 medley relay. North Carolina will finish their regular season on Saturday against NC State in Raleigh. For Duke, this was the last meet of their regular season.